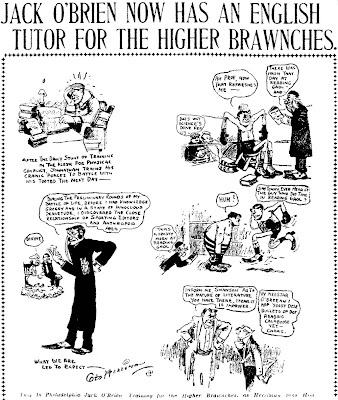 The run-up to the O'Brien-Burns heavyweight championship bout has Herriman giving them the nudge in these cartoons of November 21 - 23 1906. Jim Jeffries was cartoon-worthy as well since he was to referee the big fight (and apparently weathered a tornado along the way). "Where in the world is Beany’s goat?" "Prosecution wrought up over goat question. Fear other goats may follow." Of course everybody knows Mary Jane because she is Buster Brown's constant companion, but very few people know the real Mary Jane in private life. And there is such a little lady -- yes, very decidedly. Her name in full is just Mary Jane Outcault, and she lives, when she is at home, at Flushing, L. I. But she is not always at home; indeed she is quite a globe trotter. Every little girl In the land knows the hair ribbon that she has made famous, and most any little girl would be proud to own as large a collection of such ribbons. Many a poor little girl has been made happy by the gift of one or more of these bow-knots, for Mary Jane is a very generous girl. One of the reasons Buster and Tige love her is on account of her generosity. But another reason -- and it is so with all the men -- is that she wears such pretty and stylish frocks. And why shouldn't she wear lovely frocks? She is so much on the go and is so very well known that she must always be exquisitely gowned. Well known? Why shouldn't she be well known? Is not her portrait on lithographs all over the land, proclaiming the fact that Buster Brown Is coming? And there are four companies playing this dramatization of Buster's pranks. Every child who has seen the play knows that Mary Jane is one of the princi­pal characters, and four clever little actresses have been engaged to play this imi­tation of her. Millions of children see her picture in the Sunday comic supplement of this newspaper, and her name and picture have been trade-marked, copy­righted and registered. But does she grow proud or become set-up over herself? Not In the least, for she has been used to noto­riety since she has been a baby. During her recent tour of the West she has re­ceived hundreds of letters from little boys and girls who have seen her photographs in the papers, and she has spent many hours In answering these letters. Innumerable presents have been received by her from admiring friends and strangers. Some of the gifts have been very odd ones: for instance, an inmate in a Western prison who had been made happy once a week by the comic supplement sent her a beautiful belt made of horsehair with a silver clasp, all his own work, with a letter telling of his admiration. One Western millionaire sent a gorgeous doll on Christmas to her hotel, thanking her for the pleasure she had given his little girls. A rich Californian presented her with a ring made of gold from his mine and containing two beautiful diamonds, while another miner presented her with a cross and chain from his mine. 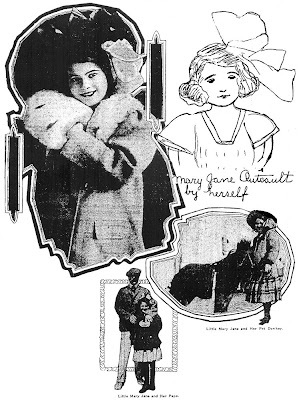 So many dolls did Mary Jane receive that a special trunk had to be bought to carry the collection, which also included a stuffed effigy of Tige, a large stuffed monkey and two Teddy Bears. They did not receive the attention from her that they deserved, however, for she was so busily engaged in answering the scores of letters that daily came to her. And in one of the largest and best-known restaurants in Denver her picture adorns the wall above one of the tables, that is known as the Mary Jane table. her pity and always receives a caress from her. Among the many letters she receives are frequent appeals for aid, and most of these have been granted. Should she not be happy? Has she not had Buster and Tige for friends? The birds sing, the flowers bloom, the sun shines, and do these things not make her happy? She has two dogs and three cats and until recently she possessed a horse with the distinguished name of Beaconsfield, which she presented to Mr. Albert Bigelow Paine. Although this little lady has been much abroad and has seen most of the interesting sights of Europe, she prefers her own country. The painted desert of Arizona and New Mexico, the mountains of Colo­rado and the orange country of California are more fascinating than the snow-clad Alps or the historic Rhine. Mary Jane feels keenly the responsibil­ity of being Buster's side partner and play­mate. She realizes that Buster is con­stantly in need of new pranks, else his vocation would be gone. She knows that it is necessary for something funny to happen, and things do happen; sometimes only in her imagination, but they must happen. There are those, perhaps, who imagine that Buster's history is purely and wholly fiction, but Mary Jane can tell them better. Many of the odd experiences portrayed in the pictures have been the plain fabric of truth unembellished by the flounces of imagination. For instance, when Mrs. Brown buys an electric flatiron to use in hotels when on a tour in the West, and appoints Buster and Mary Jane as a committee of two to attach it and put it in working order, one doesn't have to use much imagination in order to divine what is going to happen. Mary Jane real­izes the possibilities in every situation, so when she and her Buster brother are flying along in their automobile on a Long Island road, and see some pretty little baby pigs, and proceed to purchase one from the farmer, she knows before she reaches home that a pig in an automobile is a silly situa­tion. Naturally, this little lady would be thus inclined, because she has been reared in an atmosphere where people create. The poet, the composer, the author and play­wright are constantly her companions, and so her imagination has taken a practical turn. Humor is a commodity in her home. And Tige, well, he seems to know what it all means; dogs always do. Are dogs humorous? Of course they are. They are worth studying and know­ing, but they are democratic. You can't win a dog's acquaintance or friendship with a letter of introduction or a ton of credentials. You must like him and he'll like you. Mary Jane knows this. She caresses every dog and horse she meets, and none has ever failed to respond and look longingly after her as she disappears up the street. She has found that in all countries animals speak the same tongue. If poor Mary Jane's mail increases as it has done during the last few months, she feels that some of the letters will have to go unanswered, as it will require more time than she will really be able to conscientiously give to it. But, alas! Mary Jane is growing. Soon the famous hair ribbon will be put aside, the "cunning" little "Mary Jane haircut" will be no more. The pretty frocks will he worn by less fortunate little girls to whom she will have given them. Many children may feel sorry, but not she, for her ambi­tion is to have long hair and long skirts, and become an artist, so that she may work out her own ideas herself. given to Mary Jane was from Col.John Singleton who owned the Yellow Aster gold mine in Kern Co. CA. I own the chain ... inherited from Mary Jane my grandmother. PS typing the safety words below is not my suit as I mess up mostly -but will try. Sam Rawls, who went by the nome de plume 'Scrawls', produced Pop's Place for King Features. Pop is a bartender who, along with his partner Harve, served up laughs from March 24 1986 to sometime in 2001. The strip was originally both a Sunday and a daily but the Sunday seems to have been dropped in 1993. Rawls was a well-regarded editorial cartoonist who worked at an impressive roll call of papers, starting at the Ocala Star-Banner just a short drive from Stripper's Guide world headquarters. He then went on to the Palm Beach Post-Times, Atlanta Journal and Atlanta Constitution. Though Pop's Place had a pretty long run it never ran in many papers. Why King held onto it for so long is a bit of a mystery. King is notable for their indulgence in keeping strips that are clearly not making any headway. One tidbit about Pop's Place -- the bar setting seems to have morphed into more of a restaurant over the years. I have to wonder if the American newspaper is so prudish that the change was deemed necessary to make the strip more wholesome? Watch out Andy Capp, they'll have you joining a book club one of these days. Wow, I vaguely remember this strip. 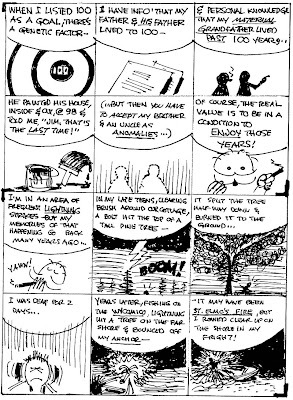 Around the time I first went to look for comics online, this strip was still around and King had it up on their site (along with others). Another strip that King had around at the time was "Walnut Cove." Remember that one? Sure; Walnut Cove was a lot like Pop's Place -- both "shrug" features. The art is okay, the gags are okay but neither are particularly memorable. So if they got cancelled from your paper you just shrugged and went on. I found it interesting that one of the best Pop's Place gags I found was in the two drop panels of the second sample strip. The main gag is barely a gag, but the drop panels are pretty darn funny. Why waste 'em in drop panels??? Hello, Allan----According to my Brother Mark, POP'S PLACE ran from daily from 3-31-86 to 4-6-02, and Sunday from 3-30-86 to 6-13-93 in the US, but was still marketed internationally until 4-7-02. (In the Toronto Star, for example.) 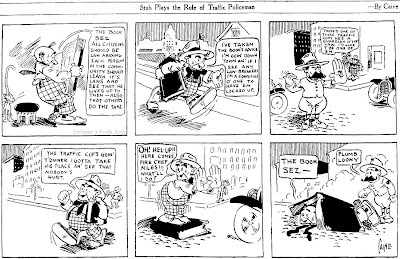 At it's peak, this strip ran in about 60 papers, including the EAU CLAIRE LEADER-TELEGRAM and the SEATTLE POST-INTELLIGENCER.--------Cole Johnson. Thanks for the end date on Pop's Place. I'm curious about the Sunday -- why would King continue it but not offer it to the US market. If they have to do the production work anyway, what benefit is there to making it available only outside the US? Hello, Allan-----King Features has a bunch of strips and features that are only run internationally. (BRINGING UP FATHER, for example, lives on in reruns overseas. )In the case of POP'S PLACE, the reason the Sundays were relegated to the foreign market are obscure. It was sub-syndicated by the Toronto Star throughout Canada, and sometimes King will sub-syndicate a Toronto Star feature. (Remember "HORRORSCOPE" ?) -------SNARKY COMMENT ALERT: Why did the characters in POP'S PLACE always have those spots floating around their faces? It's a device I associate with lightheadeness, being high, or about to pitch your oreos. These characters aren't healthy!---------Cole Johnson. I never noticed those spots until you pointed them out. I guess they mesh well with the spots orbiting my own head. I still have some college newspapers from Florida Southern College in which Scrawls sports column appears. Where is he new? I assume he's retired, but that's just a guess. Here's the other temporary Sunday strip I mentioned in yesterday's post. Mr. Stub, aka Stub, aka Stubbs, ran April 20 - June 8 1913 in the St. Paul Pioneer Press. The cartoonist is Caine, who occasionally went by the nickname "Empty" Caine (M.T. Caine perhaps?). 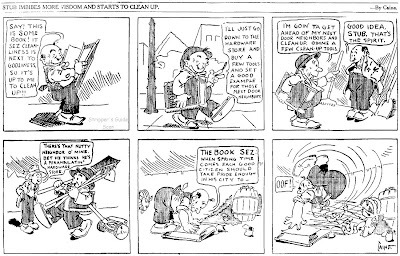 His cartoons were a constant feature of the Pioneer Press in the teens. I've never found his full name. Thanks Sara! There was a bonus, too -- they gave "French" of the Chicago Record-Herald a full name, George W. French. Hmmm, George W. Seems familiar somehow. 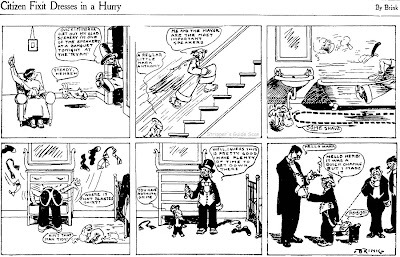 This strip easily outdoes the 1903 New York Herald Citizen Fixit series for obscurity. This version ran in the St. Paul Pioneer Press from April 20 to July 6 1913. 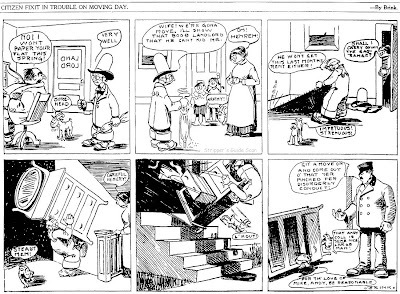 Along with another strip we'll probably cover tomorrow, it was used as an in-house produced stopgap while the Pioneer Press was shopping around for a new syndicate to supply their Sunday funnies. What's really interesting about this strip is that it is signed Brink, and the signature looks like the one used by Robert M. Brinkerhoff, later the longtime producer of Little Mary Mixup. I checked the various biographical material for Brinkerhoff and none refer to him having spent time way out in Minnesota. 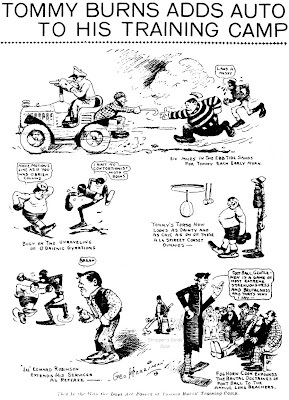 In fact reliable sources have him arriving in New York in 1913, so if this Brink is Brinkerhoff, this strip had to be pretty much his last hurrah there. Which Twin has the Boni? When syndicates send out proof sheets of their features to newspaper clients they usually do a good job of checking them for errors and problems beforehand. Inevitably though a problem will occasionally slip by and the syndicates have to send out replacement proofs. The problems are usually minor, like a misspelling or typo, or sometimes the editors will miss something that goes against syndicate policy, like depicting snakes (the Chicago Tribune had a rule about this) or a gag deemed to be in bad taste. Here's a sample of a Laugh Time panel that had a wee problem that had to be corrected. Thanks to Cole Johnson for this item. Am I reading the panel correctly to understand what needed to be changed? 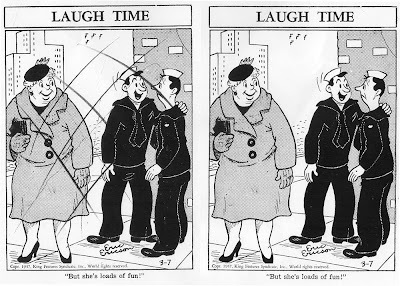 The sailor on the left appears to have the number "2" stitched on his crotch in the rejected panel, with no such stitching visible in the accepted panel. Kind of weird (that such a pattern would have been drawn there in the first place, and that an editor would have taken offense at it). Never lose that innocence buddy; its precious. Which one are you? Rod or Tod Flanders? Well, now I get it, and you can understand why I remained anonymous, because I feel kind of stupid now. Nonsense, Anon, count yourself as a cut above the rest of us dirty-minded pervs!